“It has been a long time coming and so it is with enormous pleasure that we announce the Gryphon “None the Wiser” tour.” The band hope also to announce further shows soon… for these dates and any future shows – please visit the TPA UK GigGuide. 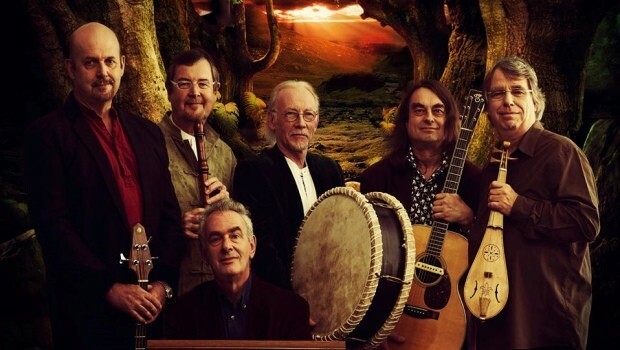 “Gryphon is the oldest and the newest thing – a legendary British band that’s as exhilarating, energetic, unpredictable and addictive now as it was when the boys last toured, in the 1970s. At that time, no-one could pigeonhole Gryphon. When the first album came out, the band appeared on BBC Radios 1, 2, 3 and 4, all in the same week. They appeared with Yes at Madison Square Garden and Houston Astrodome, played festivals, folk clubs and cathedrals. 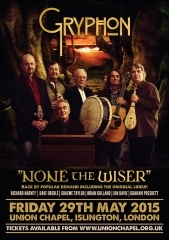 They wrote the music for Sir Peter Hall’s National Theatre production of The Tempest at the Old Vic and subsequently became the first Band to ever play in this prestigious venue and found a unique place in the hearts of folkies and prog rock fans, Early Music aficionados and others with an ear for something fresh and different. Now Gryphon is back, reinvented and mixing old and new material. The virtuoso musicianship and composing flair that marked the band out in the ‘70s has been pushed even further, as the band members have gone their separate ways for the last three decades. 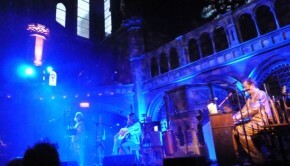 Over the years, members of Gryphon have worked with Musica Reservata and The Bootleg Beatles, Paul McCartney and Alan Bleasdale, the Royal Philharmonic Orchestra and Kate Bush, John Williams and the other John Williams, Elvis Costello and Home Service, Hans Zimmer, Max Boyce and Desmond Dekker, David Byrne, the Albion Band, the Royal Choral Society, Long John Baldry and the New Scorpion Band. New recruit and old friend Graham Preskett has played with everyone from Van Morrison to Cher, arranged the strings for Gerry Rafferty’s Baker Street, and contributed mandolin to Captain Corelli’s Mandolin, tango violin to Moulin Rouge and harmonica to Thelma and Louise. Individually or in combination, the members of Gryphon have been involved in mediaeval mummers plays and the Cambridge Footlights, led the pit orchestra for West End theatre hits like Anything Goes and performed at events ranging from Glastonbury, Cambridge and Cropredy to major cultural festivals in Europe. They have written concertos for guitar, viola and recorder and scored countless films and television series. Guitarist Graeme Taylor is currently Music Director for the smash-hit West End production of War Horse, and was also MD for The National Theatre’s revival of The Mysteries. The songwriter for both those shows was John Tams, with whom Jon Davie and Graeme work with in Home Service, BBC 2‘s Best Live Act 2012. Brian Gulland – the wild-eyed, wild-haired, crumhorn-wielding warrior-wizard whose iconic presence seemed to define the band – moved to France for a stint with Malicorne before returning to his UK roots as a member of the much-loved New Scorpion Band. Gryphon’s music? It’s just as it always was – odd, different, good-humouredly dazzling and acoustic, with crumhorns and bassoons alongside guitars, keyboards and imaginative percussion, played by singer Dave Oberle. Every gig involves roughly 40 instruments, so the textures can be pretty varied and unfamiliar.